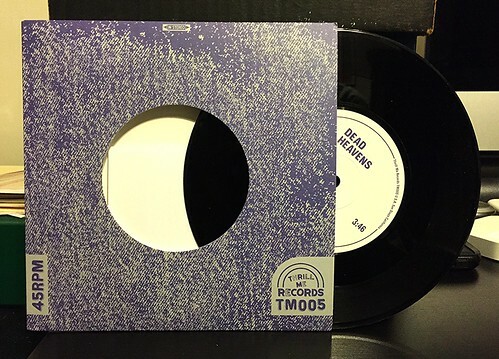 I Buy Way Too Many Records Dot Com: Dead Heavens - History In My Hands 7"
Dead Heavens is a new band fronted by Walter Schreifels of Gorilla Biscuits/Quicksand/Rival Schools fame. I can't say I was ever all that big of a fan of any of those other bands. In particular, this guy I used to work with played that first Rival Schools record every day for about a 2 year period, so I kind of hate that one to be totally honest. Based on their pedigree, I'm not really sure why I picked up this Dead Heavens 7", but when you start to trust a record label sometimes you take some chances. I'm actually pretty happy with this 7". "History In My Hands" has a warm, slightly distorted guitar sound. Cleaner than you'd expect, it's a laid back, kind of poppy song. There's a slight 60's influence and I absolutely hear a little of quieter Nirvana in the verse. There's a somewhat goofy guitar solo that sounds like something out of a 70's rock album, but it's brief and doesn't disrupt the song. "36 Chambers" is a slower song and it leans on heavier riffs. The vocals are the star of this as they cut through the distorted muck and keep everything on track. There's a fair amount of 70's guitar wanking on this one and I don't like it quite as much as the A-side, but it's still a pretty decent song. Considering I'm not usually a fan of Walter Schreifels' other bands, it might be something of a surprise that I like this 7" as much as I do. I wish I had gotten it in time to snag the limited blue vinyl version and I'd definitely check out a full length if they release one. I'm actually curious what fan's of Walter's other bands think of this. Let me know.